Here’s my review on the Etude House BB Magic Cream which is the first BB Cream I’ve ever tried and the first Etude House product I’ve tried. So do bear in mind that I cannot compare this with any other brand of BB Cream in the market. I found the packaging very cute and very strange. 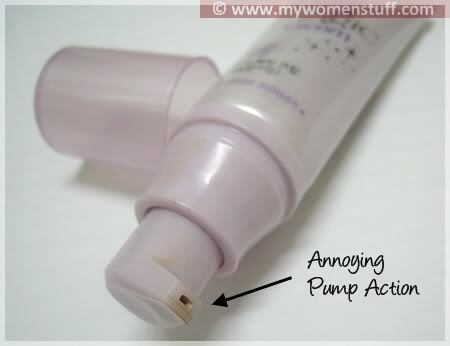 It comes in a soft plastic tube like a moisturizer or facial wash, but instead of being capped, it is capped off with a pump. In most cases, tubes don’t come with pumps and this is the first time I’ve seen anything like this. The BB Cream I got was in Refreshing which is a light lotion that is recommended for normal-oily skins. The sales assistant told me it worked as a makeup base and foundation so you just have to apply it after moisturizer. Take note that this is NOT an all in one moisturiser, foundation product. I checked the ingredient list and it listed Titanium Dioxide as one of the ingredients but it does not say that this product has SPF (There is a separate BB Cream with SPF). I’m not sure why. The BB Magic Cream comes in only one shade. The label warns you that upon applying there might be a whitish cast on the skin but it should fade and blend into your skin after a while. I was worried when I saw the shade that pumped out from the tube. It looked too dark and yellow for my skin tone which usually takes the lightest foundation shades on offer in Malaysia with a touch of yellow in it. Too yellow and I look tanned and jaundiced, too pink and I’ll look slightly like an undercooked lobster 😛 Tested on my hand however, the BB Cream appeared to blend in after a spell. So, I hoped it would do so on my face. However, I smoothened it out carefully with my fingers and left the cream on my skin for a bit to settle. When I next looked in the mirror, my skin looked evened out and the colour had blended with my skintone and looked natural! Amazing. So, that’s what they mean by the “no-makeup” look 🙂 Still, I think one shade lighter might be better for me. There is also a slight floral smell but it goes away and doesn’t bug me. The BB Magic Cream is also supposed to cover blemishes so I did not use a separate concealer to first conceal my undereye circles and pigmentation spots on my cheeks during my testing period. Instead, I used only the BB Cream as concealer, base and foundation. I am happy to report that the BB Magic Cream does conceal blemishes – but only to a degree. If your pigmentation spots are dark, or if you have dark undereye circles, or if you have pitted acne spots it will not give you flawless coverage. You will still see the blemishes and marks. However, it gives medium coverage to even out the skin tone and cover up minor blemishes. Perfect for those less makeup days. If you prefer something with more coverage, apply your concealer as normal then apply the BB Cream. 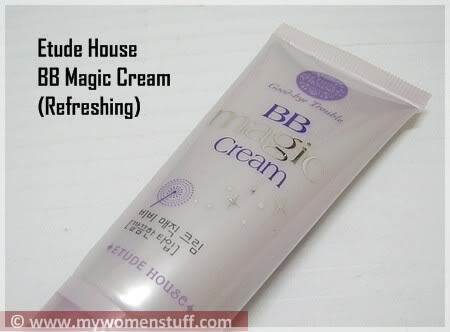 The retail price in Malaysia of the Etude House BB Magic Cream is RM42.90 for 35ml. Not overly expensive for an all in one product. I experienced no breakouts using it and its convenient especially for travel or if you are in a hurry. I did think that this is just like a regular tinted moisturizer – I can’t quite see what makes it so special, and the ingredients don’t tell me much either. I can’t tell if my skin is any better as a result of using the BB Cream but it didn’t mess it up so it gets the thumbs up! You might want to read my previous post if you are wondering what is a BB Cream? Cons: Only one shade available, Can get a little oily, Stupid pump dispenser! @prettybeautiful : Yeah I like the convenience of the BB cream. Apply and go! I have never used BB creams in my entire life! and it’s refreshing to read an article from someone who is a first time user, it’s like I”m getting the first hand experience of it myself 🙂 thanks! This is something interesting, it won’t be too drying too right? I don’t like creams wherein after applying it, some creams intensify the dryness! @Stephanie: Maybe its the oils because tinted moisturizers and BB creams are “all in one” so the moisturizer probably doesn’t agree with you. That said, I’m with you in terms of powder foundation all the way! i use the same thing and thought the pump was a bad idea too but i was wrong. in fact, i was ‘pumping’ it the wrong way. I don’t know if you already knew this but u are suppose to squeeze the tube while u pump. @Annie : Thanks for the tip 🙂 I did try squeezing the tube and maybe I just have poor motor skills but there’s no way I can squeeze, pump and catch the BB Cream all at the same time! I found that storing it and using it upright was best. This was one of the first BB creams I have ever used. (I now have 8 of them) I liked this one a lot because it did help quell the oil slick that becomes my face by mid day, and it was a decent color match. I’m sorry you had problems with the pump. Mine works just fine. perhaps you got a defective one. either way. It’s nice to read your review and hear your perspective. Thanks for the great insight! @PinkSith: Thanks for visiting and I really do detest that pump! LOL… Maybe I’m the only one. @Peny : Thank you for your support. This BB Cream is less of a foundation and more of a tinted moisturiser. It comes in only one shade as you can see above. No Etude House here *grumble grumble*. But yeah, funny eh about the tube and pump? Missha’s too. maybe u should do a before and after shot test? use it and see the results (skin without makeup) in a few days, maybe even a week? I’ve seen some people done this before. did wonder bout the BB cream, but i will take your word, give it a go! cause other than it seem so convenient (except the pump, it rise a big ? on me), it also works! @Tine : Missha is available but hard to find for me. If I’m sticking to BB creams, I’ll stick to Etude House. @miith : Since its just makeup for me, and I don’t have that much blemishes to cover (except pigmentation) a before/after won’t do it. Thanks anyway. just to check where i can get Etude House BB Magic Cream in Klang Valley. TQVM.